I think that it is fair to say that most vintage costume jewelry collectors either do their own rhinestone replacement repairs or wish that they could do them. Though not absolutely necessary, to be ideally suited for this work, you should have a minimum of four hands and no thumbs, these hands as steady as those of the average brain surgeon, and you will have slightly more patience that of the proverbial saint. Okay, just joking, but I have to start by saying that rhinestone repair work is not for everyone. I am a sick soul who actually �enjoys� doing this type of work, so I thought I�d share my tricks and techniques. I must point out that everyone tackles this project using different tools and techniques. This is not meant to be THE article on this subject, but only one woman�s story. The first step is to choose the repair piece. I keep in mind that not every piece of vintage costume jewelry is a likely candidate for rhinestone repair. Does the piece have severe metal wear? Are the stones that are present covered with old glue residue? Is the color of the missing stone impossible to match perfectly? Pieces falling into these three categories in most cases are not going to bring much satisfaction once rhinestones are replaced, and are more likely to leave me wondering why I just wasted my time doing this work. 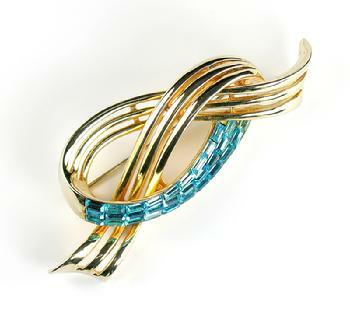 To use as an example for this article, I selected a relatively simple Coro brooch. 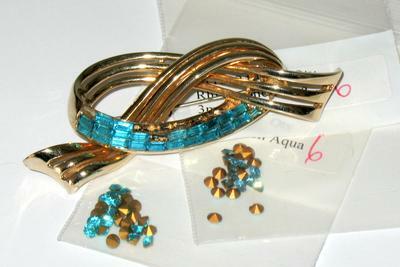 It�s a 1952 patented design and is set with aqua baguette rhinestones. Here�s the �before� picture. As you can see, about nine of the aqua baguette rhinestones are missing from this piece. Step one is to exactly determine the color of the rhinestones. Did you know that there are about six different common aqua-colored rhinestones? There are variations such as light and dark, and current versus old Czech shades of color. For my brooch, I narrowed the choice down to regular aqua and old Czech aqua, then held sample stones against the remaining stones in the brooch to determine the correct color to order the replacement stones. It is imperative to use good light and some magnification so that you can see the subtle differences in color. For my pin, Czech aqua was the obvious choice. At this point in the process, I groaned and grumbled a bit, as I know that the old Czech colors are harder to obtain the regular colors. But before we get into the stone measuring and ordering step, I first want to share my tips for stone selection and storage. Years ago, I purchased a set of the most known and currently-available shades of rhinestones in the 3mm size. The set included six stones in each color; the number of colors at that time was over 100. 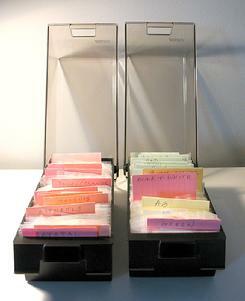 The stones arrived in 3�x 2� zip bags, and I organized mine by color and placed them in diskette storage boxes for easy access. Now that I know the color of rhinestone that I need, the next step is to determine the exact size in millimeters. For measuring stones, I use a manual caliper and find that it works just fine for me, though some people prefer to use an electronic one. When measuring a stone �cup� (the area in which the stone fits into the piece), you slide open the caliper and then slowly close it until the inside edges of the lower measuring area sit at the very edges of the cup. The reading is taken from the first long line on the bottom right-hand sliding portion of the caliper. 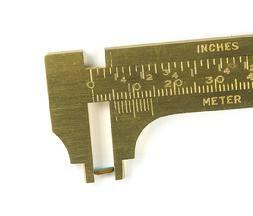 The very first time I used a caliper to measure for stones, I made the enormous mistake of assuming that the measurement was taken at the edge of the right-hand portion of the caliper rather than at the first mark. Image my surprise when my rhinestones arrived and all were about two millimeters too small! If anyone is interested, I still have a nice selection of some really, really tiny stones in a few colors. When evaluating round stones, just one measurement is needed, taken at the center of the stone. When sizing oval, marquis, baguette and other stones, you�ll need to take two measurements of the vertical and horizontal sides and for odd shapes, maybe a third measurement. For my brooch, the cup measurement was 5mm x 3mm. Since one additional stone fell out when I was cleaning the Coro piece, I was also able to double-check my measurement using the stone rather than the cup. It is much easier and more accurate to measure a rhinestone directly rather than the cup, as you can hold the stone tightly in the caliper. If you do a lot of stone replacements, I would recommend that you keep a wide variety of crystal rhinestones on hand in many different shapes and sizes. Then, when you need to measure a piece for a missing stone, you can locate the size that fits perfectly into the cup and order the indicated size in the color and quantity that you need for your piece. In spite of my initial fears, I was able to locate old Czech aqua 5mm x 3mm baguette stones for my Coro brooch. Once they arrived, I was ready to begin the stone setting process. After a quick shot of Tequila to calm my nerves, I prepared my work area by laying out my rhinestone repair tools. Really, you ask? No, not really, I�ve found that a few deep breaths are very calming and better, as the Tequila plays havoc with keeping my hands steady. But go ahead and experiment at will. Just know that I will not be responsible for the results! Before actually replacing the missing stones, it is very important to take some time to clean the cups of any residual glue or foil. Note in my first photo of the brooch the heavy residue that was present on this piece. Here is a photo of my cleaning tools and a picture of the brooch after the cups have been cleaned up. The tools include cotton swabs for wiping away residue, hard round toothpicks for digging out stuff in tiny crevices, and a dental pick and old tweezers for scraping residue in the larger areas. Please take note that my tweezers have bent tips. I know that it is hard to believe, but these tweezers originally had perfectly straight even tips which I managed to bend and break a bit when (drum roll, please) digging out glue and foil residue. The bad news is that I had to buy new tweezers for stone setting. The good news is that I can now use the damaged ones with impunity. 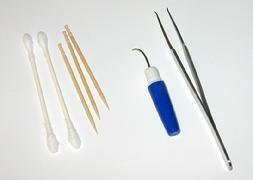 For safety, I keep the good tweezers separate from the bad tweezers so that I don�t reach for the wrong ones. It also keeps the bad ones from having an adverse moral affect on the good tweezers! Why is it so important to clean out the cups before placing the new rhinestones? Well, I would guess that it would not be hard for you to remember a time or two when you�ve seen a vintage piece with a crookedly set, firmly glued rhinestone. That is one of the results achieved when you don�t clean the cups. The other common result is that the rhinestone will only be �renting� the cup and not �buying� it for residence, i.e. when there�s cup residue, the stones tend to vacate the piece in a very short period of time as they don�t sit completely and firmly in place. Okay, all cleaned up and ready to set our rhinestones! My tools for this project are G-S Hypo Cement (which dries quickly and clearly), flat toothpicks and long pointed tweezers. I also use a heavy-duty paper plate (for laying out the stones), strips of paper towels (for dabbing up any stray glue and wiping the tip of the glue applicator), and a paper bowl in which I prop the glue to an upright position. In preparation for setting the stones, I turn all of them facedown with the foiled side at the top. The next part is actually pretty easy once you�re done it a few times. Fill the cups about half full of glue. Whether or not you want to do all of them at one time or a few at a time is up to you, and really depends on your skill level and steadiness of hand. For this particular piece, I did fill all of the cups with glue at one time and the entire stone setting process took about five minutes from start to finish. When I did my first rhinestone replacements, I seem to remember that I filled only one cup at a time and that setting each stone took about five hours; okay, a bit of an exaggeration, but it seemed to take forever! My point is that the first few times doing this can be very tedious, but you will get better fairly quickly or you will give up entirely. It�s a short schedule for the weeding out process for beginners. Back at my work table, I have just filled the cups with glue (pretend that I haven�t been talking a mile a minute in the meantime). I wait about thirty seconds, then start placing the stones. The stones are facedown so that they are sitting on the flat tables of the top sides. I hold the tweezers between my thumb and index finger with my hand up-side-down, palm facing up and firmly grasp the stone with the very tip of the tweezers. I can hear some of you laughing hysterically at just the thought of doing this, but honestly, it just takes a little trial and error and thereafter, some patience and some practice. I then turn over my hand and now place the rhinestone into the cup (in this case starting with the cup that is furthest inside and next to an existing rhinestone, working my way out from there). A flat toothpick is used after the stones are set to tamp down the stone, straighten it, if needed and to keep some light pressure while the glue sets. If a bit of glue appears at the edges when you tamp down the stone, you�ve used too much glue, but can simply wipe it away with a damp bit of paper towel. If a large quantity of glue appears at the edges and runs all over your piece of jewelry, you probably should reconsider whether or not you�re cut out for rhinestone replacement work. There are people who will do this for you, so do not despair! And a word of caution about the glue; G-S Hypo Cement (and most similar glues) contain Xylene. Xylene is a chemical compound that can cause serious health problems if not used properly. You should use it in a well-ventilated area and should avoid getting it on your skin. Read the warning labels and pay attention to basic safe use instructions. I never thought much about this until my husband, who once used Xylene-based substances in his screen-printing operation, freaked out when I told him that my rhinestone jewelry glue had it as an ingredient. He knew that I was spending hours at a time with my face directly above it and my hands getting coated in it. I, uh, don�t do that any more. Face is now well-above the glue-use-area and hands are kept free of the glue or, in the event of a little finding its way onto a finger, is immediately washed off with soap and water. After I�ve set all stones in a piece, I set it aside for at least a few hours, then do a final cleaning. And then, it�s Happy Dance time: That once sad looking piece of useless jewelry is now beautiful and ready to wear and enjoy! Just a couple of more comments before I let you go take another look at those rhinestone repair pieces in your stash. I have not mentioned any of the suppliers that I use for rhinestones, tools, glue, etc. as I know that many people sell these things and I simply did not want to recommend one over another. It�s easy to find the needed items online. I will say again that replacing rhinestones is not for everyone; try it and see if it works for you. 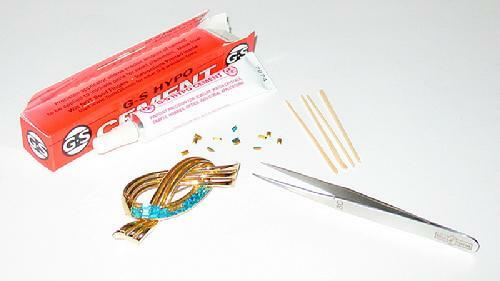 Last, but certainly not least, remember that there are many different techniques for organizing and accomplishing rhinestone replacements, including electronic calipers, dop sticks rather than tweezers, different glues, etc. This article is simply MY way.